A quick and easy Italian dish that is sure to please! 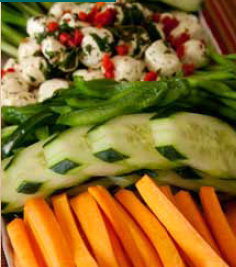 Cut vegetables into finger-food strips and arrange on serving platter. Set cruets of olive oil and vinegar on the table, along with salt and pepper. Give your diners small bowls in which to mix up a sauce with the olive oil and vinegar, seasoning to taste. They may then dip their vegetables in the oil and vinegar and enjoy.